“The aperture on the camera Man Ray used for Dust Breeding (1920) is said to have been left open the precise amount of time it took him and Marcel Duchamp to have a leisurely lunch. 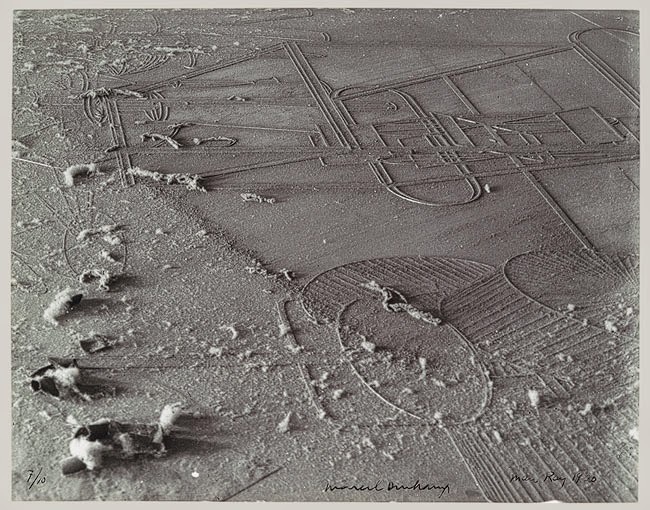 The resulting photograph—capturing a section of Duchamp’s Large Glass (1915-1923) lying in an unfinished state and gathering dust—is the index for “Idleness,” a new exhibition opening at the Jacob Lawrence Gallery on November 24, 2014. “Idleness” is the second Showroom program as part of Factory—a series of displays, labor demonstrations, motivational speeches, quality controls, and new product launches exploring the question, ‘Is a school a factory?’ The dialectical counterpoint to “Industry”—the first exhibition in the series, which celebrated traditional, industrious studio practices, and notions of labor from Auguste Rodin to El Anatsui—”Idleness” presents artists who locate the virtues of their practice in moments of pause, idleness, daydreaming, non-studio-time, convalescence, or spending time with friends. “Factory Showroom: Idleness,” Jacob Lawrence Gallery, University of Washington, School of Art + Art History + Design. Through January 17, 2014. I love this post. The Idle vs The Industrious–a clever way to categorize contemporary artists. Scott Lawrimore, the current director of the JAKE, has factory picnics in the Gallery every Wednesday where artists gather and converse. One of the great things since sliced bread! Do galleries promote the factory ethic in artists? This procedure has never been verified. Even in 1920, if this were taken in a building, there would be too many chances of vibrations to render a clear photo. This was probably Panchromatic X which had a descent speed, so that even with the lens stopped down to render the depth of field shown the exposure could have been 10 seconds. Duchamp was such a bullshitter; pretty much only older scholars believe Duchamp purchased the urinal, for example. Next Next post: Art and Film: Revenge of the casualists?